I am still busy with client sewing but have managed my 30 minute slot at the end of most days this week. I wanted to make a start on the Summer 6PAC (which you will remember I have been over planning for weeks) and rather than one of the useful basics I have jumped straight in with what should be ‘the linking print dress’. I bought Vogue 1287 in my last batch pattern purchase. 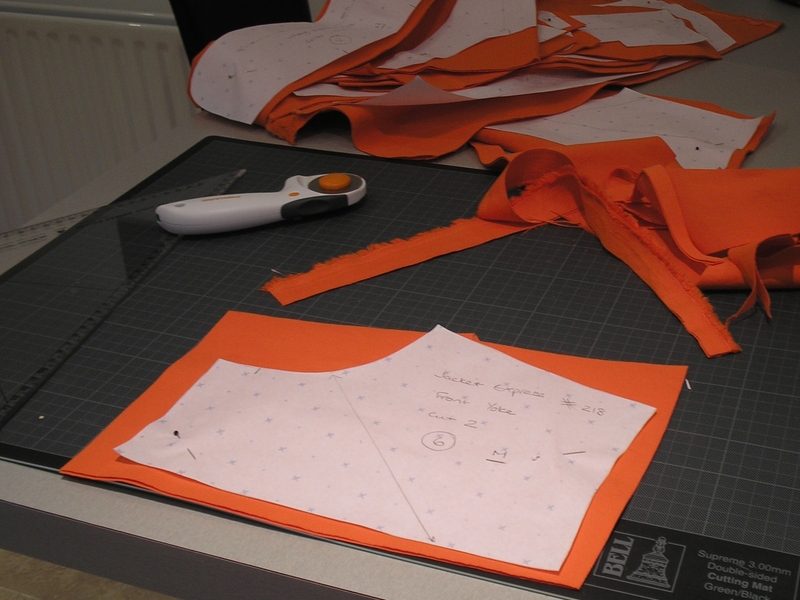 I still prefer to make my own patterns – it is often easier than making all the alterations necessary to fit my figure. However, with the memory of the successful Vena Cava design I decided to go right in with this Donna Karan dress. I really wanted to use my viscose snakeskin jersey for this. I have a mental image that says this should be a winner. And if we ever get any warm weather I know from my experience in Portugal that this fabric is wonderfully comfortable and cool to wear.The pattern seemed like it would accommodate my ‘assets’ without too much messing around so I used one after work slot to prepare the pattern, one to cut out the fabric, and the next to make all the pattern markings. That session took a bit more than 30 minutes. Does anyone else hate this process? 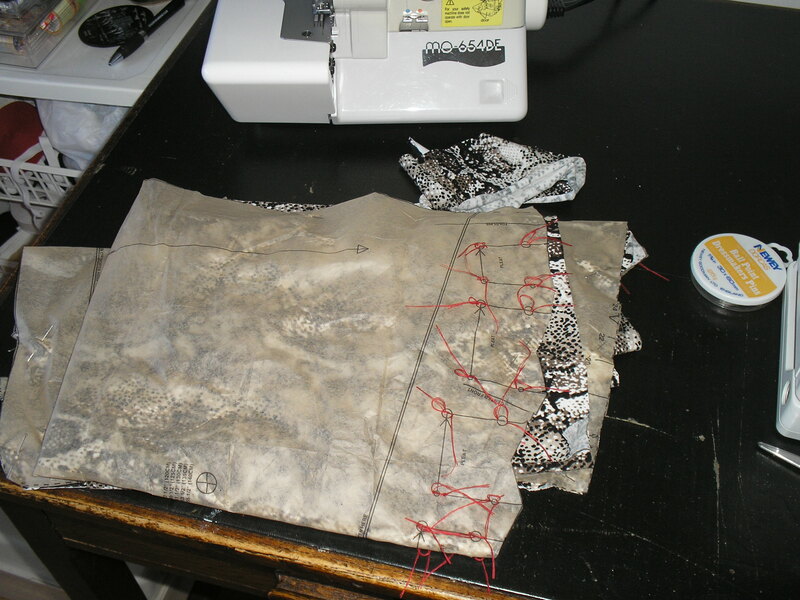 I have to say that having started the sewing process today those marks are really necessary! 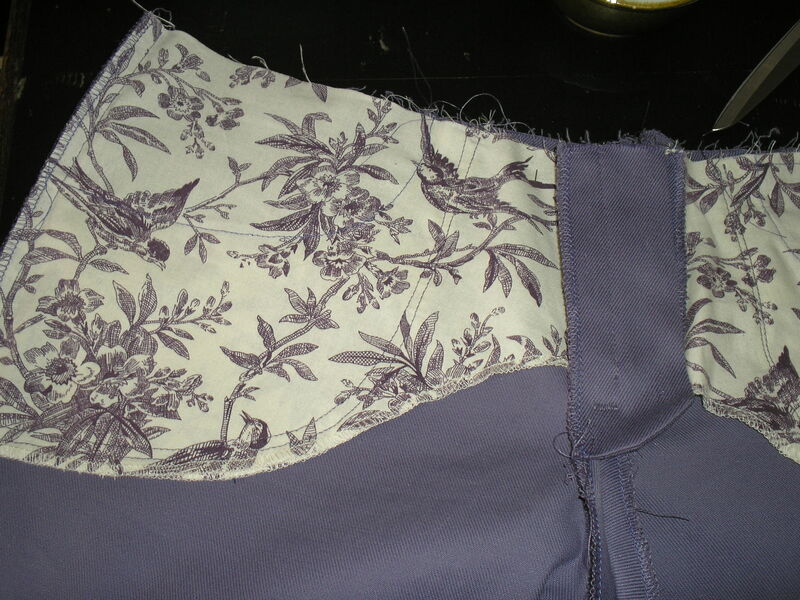 I have the bodice and skirt finished now and just need to link the two together with the waist band. I hope to get this done over the weekend so I can get on with other work on Monday. Bus mans holiday anyone? I promised to get a picture of the Management wearing his shirt – and we had an evening out to the theater last saturday when he wore it. 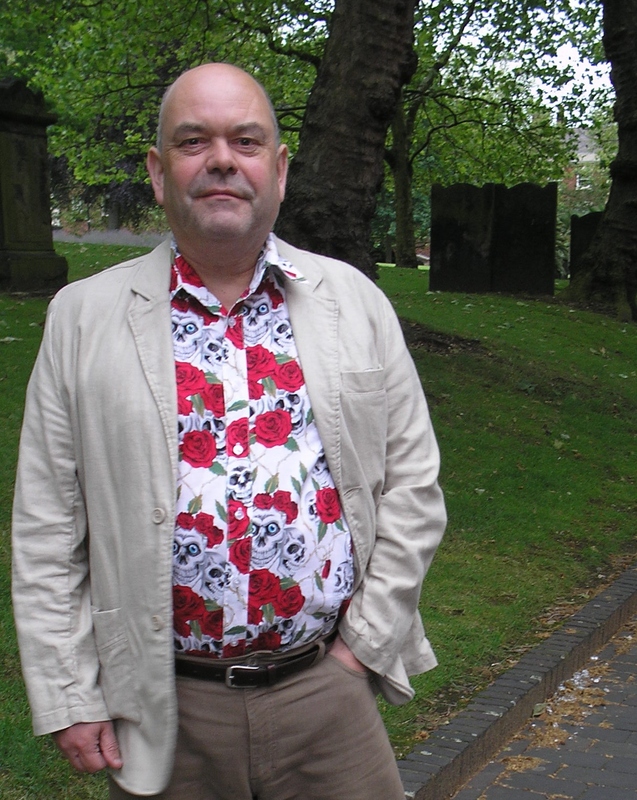 I hope you like the grave stones as background! The management likes the shirt! 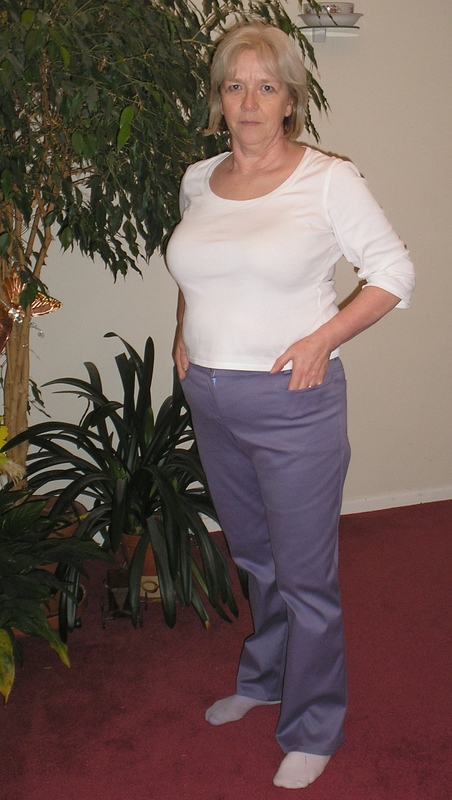 …because I have finally finished the Patrones jeans (cut out in may/june last year). 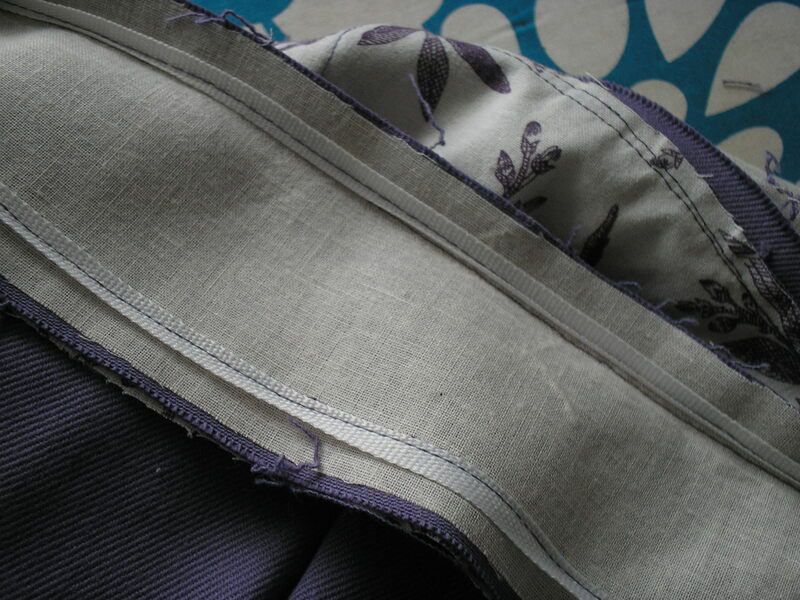 I am trying to work out why it has taken me so long to get going with this project – I know I buried them a couple of times and forgot they were there but once I actually started sewing they really didn’t take too long. I made a couple of adjustments from the original black pair. 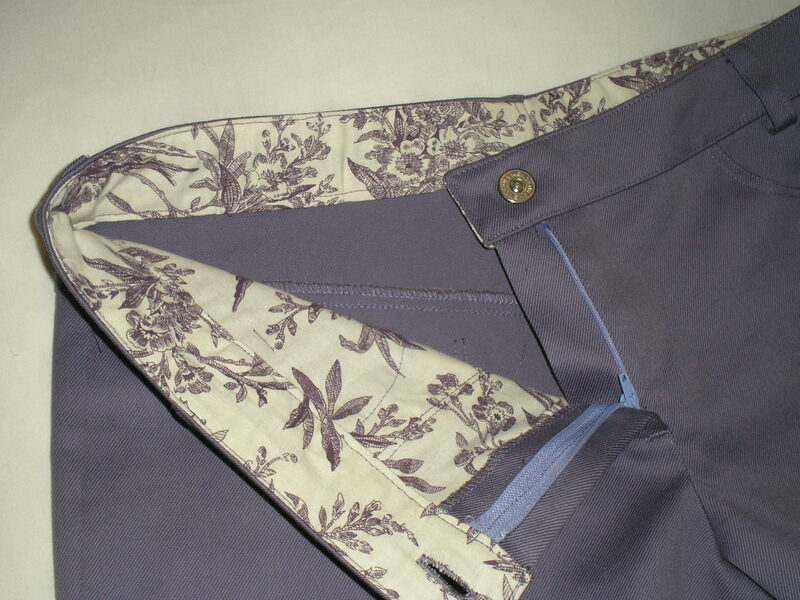 I felt that the pockets were too ‘open’ in the black pair so I raised the curved cutting line to give a smaller opening. I also reshaped the legs so that they were closer to a pair of Gap jeans I particularly like to wear. I sewed the pocket bags with the birdy print visible to the inside – I thought it would be prettier that way, and taped the waistband at both of the seams to prevent the fabric stretching (which it seems to still want to do despite being interfaced – I imagine it is because the waistband is curved).I found a hammer in button that was obviously kept as a spare to a commercially made pair of jeans which was perfect for these. I really like the contrast waistband a pocket backs – worth the effort although no-one but me will see them – and though the zip isn’t a great match I don’t mind because it is really well hidden in the underlap. Despite all the extra weight I am carrying after Christmas, and not stopping to fit these at all (sometimes I’m just reckless like that!) they got a comment of ‘Not a bad fit’ from the DH who was drafted in to take the photographs. Praise indeed. If they still fit as well after I have made some efforts to shift some excess ‘timber’ I will certainly be putting this into a file for patterns marked ‘TnT’. Mystery tool? I have one of those! 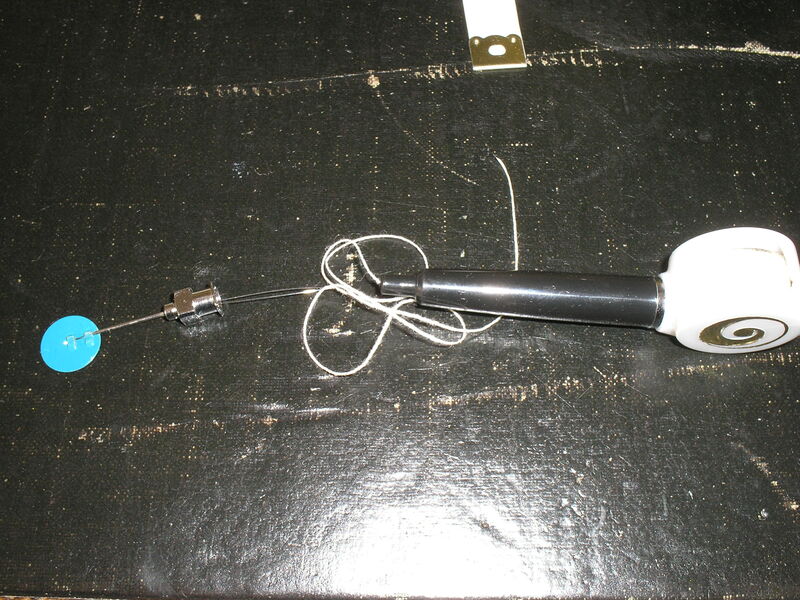 Intrigued by a thread on the Stitchers Guild site titled ‘Mystery tool’ I had to look. 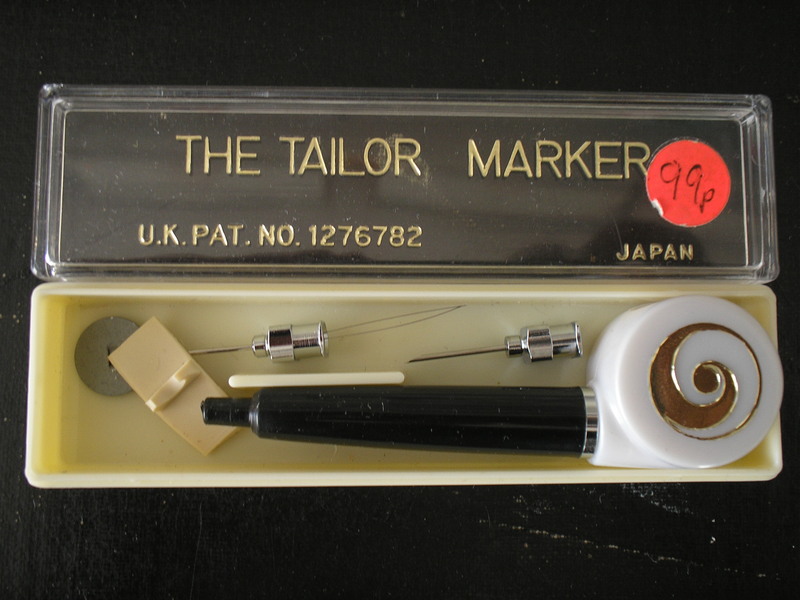 I was amazed to recognise a gizmo given to me by a friend after her mother died – I hadn’t tried to do anything with it so the comments on the thread made me dig it out and try it. 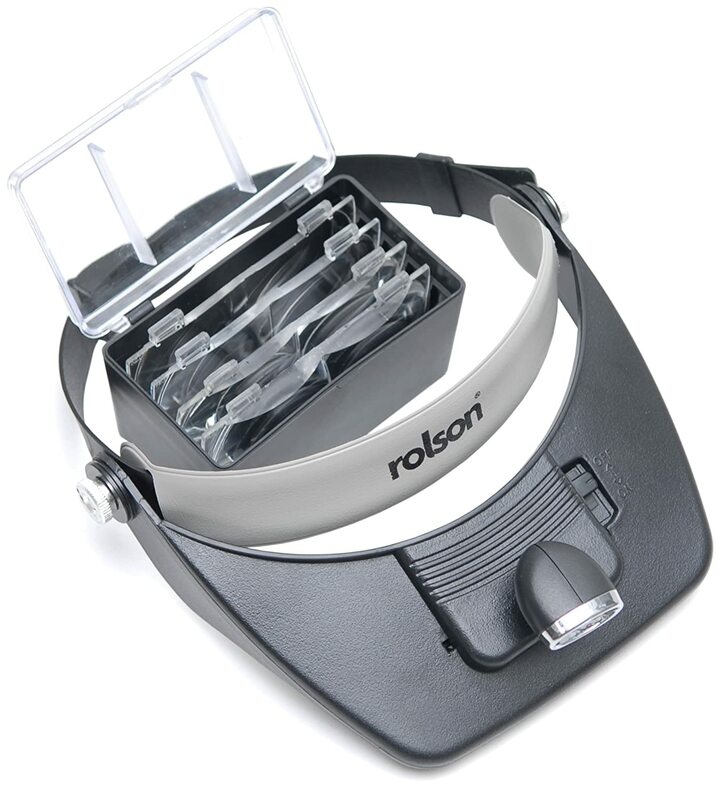 Sadly there are no instructions – or it was considered so obvious at one time that none were needed. It seems to have the pieces that Pina shows – but also has two needles which resemble hyperdermic needles (hollow centres) and a long needle threader. This has been in a drawer for at least 5 years so it was well overdue for investigation. With a little effort (and the help of a threaded loose needle) I was able to get the thread down the tube and within range of the threading aid. 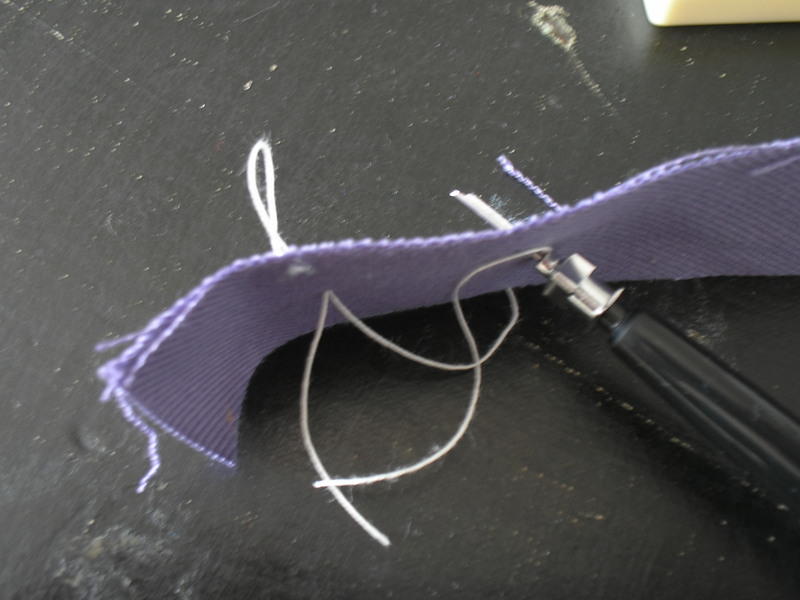 With the needle pushed onto the tube I just pushed it through the fabric and left a loop on the back before pulling the needle back. I think if I had repeated the action it would have given a more secure marking but it really does leave a tailors tack! With a little practice I think this could be useful !